Visit our BE INFORMED section weekly for feature articles, news and reviews as we showcase the artists, events, productions and related stories happening across Niagara. 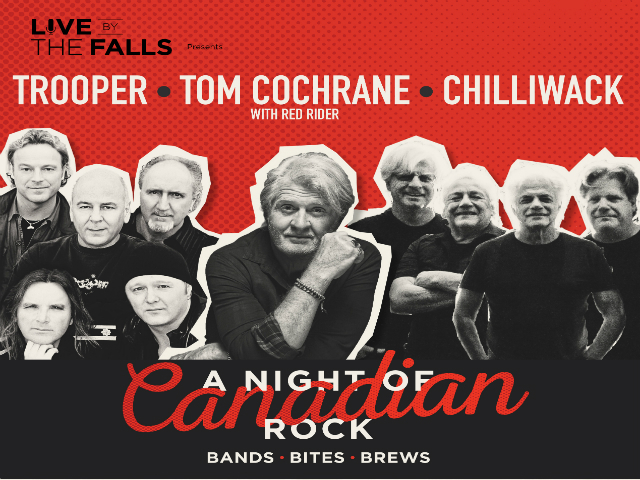 Live by the Falls closes out the year with A Night of Canadian Rock on December 28, featuring performances by Chilliwack, Trooper, and headliner Tom Cochrane with Red Rider. Including a Bands‒Bites‒Brews theme, concert-goers can listen to these legendary rock bands while treating themselves to a wide assortment of Canadian bites and brews. Sponsored by 91.7 Giant FM, A Night of Canadian Rock is the hottest ticket in Niagara Falls and a sure-fire hit for music fans who love the classics. © GoBe Weekly - Niagara Entertainment 2015.